their favourite spot in their property. Several people use their garden to relax and enjoy a great time with the family members. sight of flowers, koi fish and the plants around and breathe a fresh air. enhance the beauty of your beloved spot by adding a fountain pond in the garden. 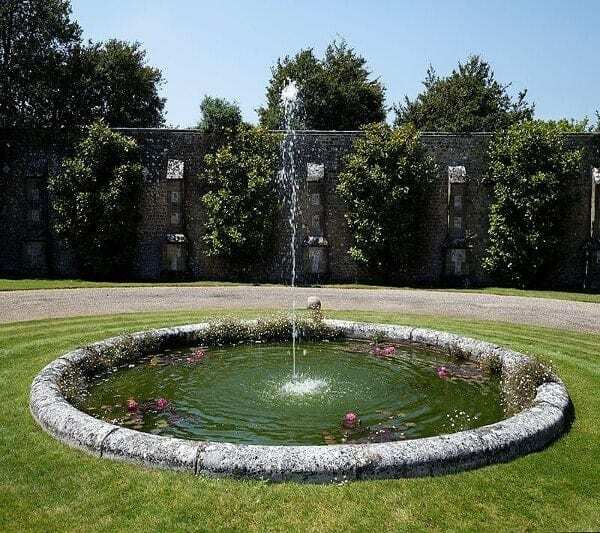 No doubt, the fountain pond makes the garden look more visually alluring. Plus, the sight and the sound of flowing water can be therapeutic and relaxing too. by adding the right type of lighting. add a great theatrical value to your otherwise ordinary looking fountain. Here are a few important tips to choose the right type of light to your fountain pond. fountain, which would affect the beauty of the centerpiece of your garden. also, make the fountain look quite magical. install and make the surface of the water glow from above. 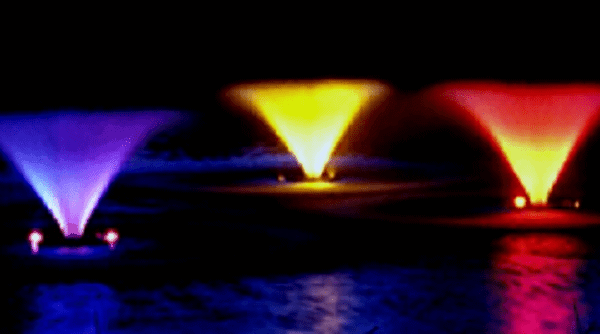 lights do not emit strong light and therefore do not impact the temperature of the water in the pond. Not to mention, the LED lights are much cheaper than halogen lights. be a better choice illuminate the fountain area in an effective manner. lighting for the fountain is the surrounding area. The best way to light up the fountain area is to create the right mood. Apart from the design, the type of the bulb and the mood that you want to create, you also need to pick the right wattage. sufficient; for larger koi ponds, 20 to 40 watts bulb will create enough illumination. fountain and highlight the beauty of the flowing water, it is best advised to play with angles of the light. flowing visibly from all directions. What is the best pond fountain? FLF 1 HP Floating Fountain. How does water fountains work? allowed to flow down the outside of the structure of the fountain. The water that is sprayed into the air will fall back onto the fountain and drain back into the reservoir. Presence of algae is one of the greatest potential problems you are likely to find in your koi pond. management, the types of algae are divided into suspended and filamentous. appears as an algal bloom in the pond to resemble pea soup. Blanketweed, Silkweed, and Mermaid’s hair. Read on to discover how to cope with algae in your garden koi pond. Presence of algae in your pond does not mean that it’s unhealthy. However, it comes with considerable distress and ruining of your pond’s visual appeal. Suspended algae create a very unpleasant bloom during the spring. plant life in winter becomes non-existent. havoc until more developed plants take over. in the water, they have to compete with more primitive algae. The plants are more likely to decline to make the water become clear. During the year when green algae bloom, it disturbs the natural balance of your pond. establish because of troublesome suspended algae. You have to be patient to give the plants time to get established. The pond will eventually clear if you strive to create a balance between the plants and fish. There is a high temptation to empty the water in your pond and refill it with fresh water. This can alleviate the algae from your pond for some time. However, after a few days, you are likely to come face to face with more algae after a short while. The fresh water from a tap has mineral salts than enrich the water for more algae growth. unless you properly balance the pond. to protect your fish and manage the growth of algae in your pond. Filamentous algae is very persistent and troublesome. It forms huge floating mats where the lower parts might begin to decompose because of lack of light. algae debris and foul smell from happening in your pond. The aerator regularly turns the water to allow free movement of oxygen from top to bottom. Installing a fountain in your pond is the ideal solution to keep algae at bay. It helps to mop up nutrients in the water and promotes the smooth flow of oxygen to sustain fish plus other aquatic life. Removal of excess nutrients from the water deprives algae of the opportunity of such plants from growing. If you wanted to puchase koi fish paintings click here to my Etsy store. How do you keep pond water clear? 7 tips below to help keep your pond water clean! Choose proper filtration for your pond. Is algae bad for fish in a pond? finished degrading fish and plant waste. a determination to good fortune and even representations of courage. designs by people of all backgrounds, and for a good reason. steps so that it is not just the motifs that are calming, but your lifestyle as well. designed home, aim to choose design elements that suit you. that have very little in them; others are more maximalists. What is important is that you feel completely comfortable and relaxed when you are at home. Just as the right Zen space is important, so too are the right lifestyle changes. taking a step back and slowing down their habits. Try to do more activities that take time, and put more effort into them without any distractions. fun, varying activities into your week. Your stressors must be dealt with directly. For most, this will come in the form of their work. If the monotony of your job is causing you strife, compensate by adding more fun into your personal life. If your job doesn’t seem to end when you go home, start setting healthier boundaries. only do that when you feel comfortable enough with your personal life. When you take the time to truly have fun, you relax and begin to enjoy life even more. What’s more, by getting involved in the activity you choose fully, the greater the payoff will be. Unibet to better your game and to improve on strategy. You could also host a poker night where you and your friends all get together. with the activities you love, and the more varied these activities are, the better. It can be difficult to make time for others, but it is time that we start prioritizing these hang-outs. bring true harmony and serenity into your life. What does it mean to be in your Zen? The whole point of Zen practice is to become fully aware, here and now. … Very Zen. the Sanskrit word ‘Dhyana’, which translates as ‘meditation’. What does it mean to feel Zen? The definition of zen is slang for feeling peaceful and relaxed. An example of zen as an adjective is to have a zen experience, how you feel during a day at the spa. What is the purpose of Zen? rushing about in an aimless (or even a purposeful) stream of thoughts. that strongly emphasizes dhyana concentration-meditation. true nature, or the emptiness of inherent existence, which opens the way to a liberated way of living. How do I find my Zen? Zen — and finding it — simply means slowing down. Imagine your day as a movie. Take deep breaths with a mantra. First, find your breath. Be an early bird. The morning hours are the quietest, and finding some “you time” then can set the tone for your entire day. What is a Zen state of mind? expression meaning the mind without mind and is also referred to as the state of “no-mindness”. That is, a mind not fixed or occupied by thought or emotion and thus open to everything. How do I get more Zen? follow) will be familiar to long-time Zen Habits readers. Buddha nature is just another name for human nature – true human nature. Zen is simply to be completely alive. Zen is short for Zen Buddhism. It is sometimes called a religion and sometimes called a philosophy. sand that is raked to represent ripples in water. No pond owner would like to see their pond lifeless. In the same way, a pond with a foul smell is not what anyone would look forward to. Apart from treating weeds and algae, it pays to keep your pond healthy. A pond in a bad state is a result of excess nutrients, decayed leaves, and stagnant water. fountain promotes a livelier pond. Having a fountain on your koi pond promotes water movement. A fountain significantly improves the health of your pond in various ways. The most significant benefit is the ability to make your pond look livelier. This is done in the following ways. Gaseous exchange A fountain in a pond helps in gas exchange. Movement of water in the pond increases oxygen content in the pond. This helps eliminate gas build up. It will help to lessen chances of a foul smell in your pond. The movement of water ensures the absorption of oxygen once the water is exposed to free moving air. pond to support aquatic life in the pond. is by installing water pond fountains. The fountain continuously breaks up algae on the water surface preventing its growth. Additionally, low oxygen in a pond promotes the presence of excess carbon dioxide. This promotes the growth of algae, which is not good for your pond. nutrient build up to make the growth of algae harder. A floating fountain adds interest and beauty to your pond. Installing a fountain in your water body will add beauty to your landscape. can buy your fountain online from a reliable supplier for convenience and cost-effectiveness. In warm weather, the water also warms up and makes oxygen less in the pond. Therefore, it’s very important to ensure that your fish have enough oxygen in the pond. This prevents fish from suffocating which might cause a foul smell in your pond. The best idea to promote aeration in the pond is by installing a floating fountain. Adding a fountain to your pond will significantly enhance the beauty and health of your pond. hour to keep your pond in good condition. features such as lighting and spray patterns to give a spectacular view of your water body. up with a fountain customized to meet your requirements.